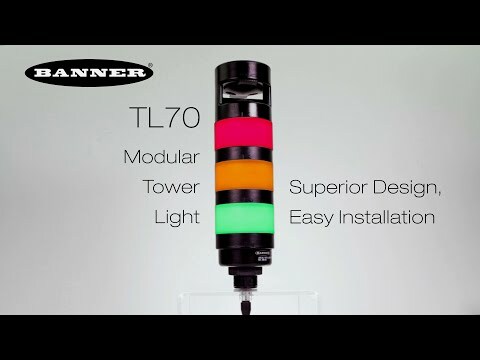 Minneapolis, MN—July 21, 2015—Banner Engineering introduces the TL70 wireless tower light. Combining the company’s industry-recognized tower light family with its field-proven Sure Cross® wireless technology, the TL70 wireless tower light provides superior monitoring and visual status indication for remote applications, general and machine status, mobile call for parts, mobile work stations, threshold sensing and other applications where wired solutions are not cost-effective, practical or possible. The TL70 Modular Tower Light is another solution from the leader in lighting & indicators designed to help you work smarter and more efficiently with better visual management.